Bored and distracted in the classroom at St. Andrew the Apostle, I’d often fantasize about a figure I’d occasionally draw in my notebook with fetishistic attention. 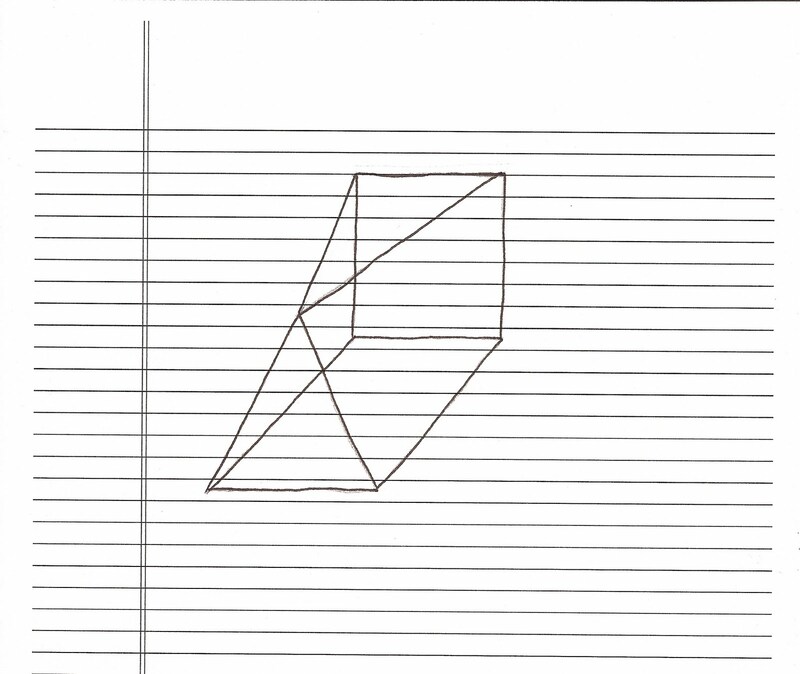 My drawing was an impossible thing, an unnatural object, couldn’t be made. I was too young to know about M.C. Escher’s work or to understand optical illusions, so my discovery felt new and strange, and somehow forbidden. I loved that I could draw something that couldn’t actually exist in nature, that I’d create — the stirrings of language and the power of the imagination in a fourth-grade classroom. 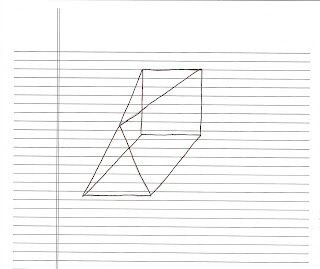 My object was a triangle connected to a square: the two sides tapering from the square had to slope gradually until they reached the triangle front. I was young and didn’t how factories worked or how finely-calibrated machinery might replicate this: I’d simply stare at what I’d wrought and the top of my head would come off. This can’t happen! This next impossible thing would steal toward me at night — actually, I’d chase it. A three-adult-tall, jet-black wall dotted with a hundred finger-sized holes. Who'd built it, where it came from, where it’d go, I didn’t know and wouldn’t pretend, only that the wall would materialize in the middle of the playground at St. Andrews in the middle of recess. If I stuck my index finger into the correct hole, the world would stop spinning, time would freeze. The desire of any body exhausted by the agitation of puberty: to halt things for a second, so I can rush headlong in. This had a lurid appeal for me: with the girls around me frozen in place, I could indulge the forbidden and lift skirts, unbutton blouses, enact in reality what had plagued me in hormone fantasies. And: the bullies, locked in place now, their menace around the swing sets or brewing on the low wall beneath the basketball hoops stilled in a tableau of impotence. And I, skulking between and among the powerless boys. The impossible and the sacred, a church of the body. We all remember: here’s the church here’s the steeple open the door and see all the people. When no one was around I’d play open the door and where are the people? Always romanticizing absence and loss, I liked the idea of the empty church — although it was sad, too — and that I could build that church with my hands. Linking my fingers, I could create a space and peer in, see a quiet church, see post-church, see loss made. Gaston Bachelard: "One must go beyond logic to experience what is large in what is small." 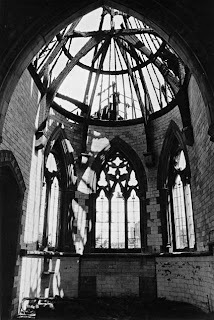 Over twenty years ago I came upon an abandoned stone church in London. The building, intensified by the dim weather, seemed an organic chunk of earth ascending in vain, and I felt compelled to move toward it to explore the grounds. I slipped through a hole in a fence meant to keep me out, and stepped onto thinning grass and then broken sidewalks toward a large door covered in vines. The natural world had begun the task of claiming the edifice back into the earth. The grounds were quiet, the near Hampstead traffic hushed. I moved toward a window that hadn’t been boarded-up, or maybe had had its shabby particle planks removed, and I peered in. Several rows of silty pews materialized in the darkness; the center aisle became apparent, as did a sacristy, and slowly a choir loft, and then a jittery movement among crumbling pews and in a nanosecond a pack of wild dogs—eight or more—bolted upright in unison, baring their teeth and growling guttural warnings toward me. Utter fierceness. The pack leader rising in intensity and determination, eyes yellowed, piercing, leaning toward me. Drenched with hysteria, I darted from the grounds and ran breathlessly for blocks, disorientated, frightened, and exhilarated. No map could have augured: nature had risen and pronounced that I was trespassing.